Even though I usually restrict this blog to Burnaby outdoors, there’s such an exciting story happening right now in New Westminster that I’m briefly stretching the Burnaby boundaries to encompass our Royal City neighbour. For the purposes of this story, New West becomes honorary Burnaby. If you rush down to Queen’s Park right now, you can find a one of the rarest birds ever to show up in Canada. 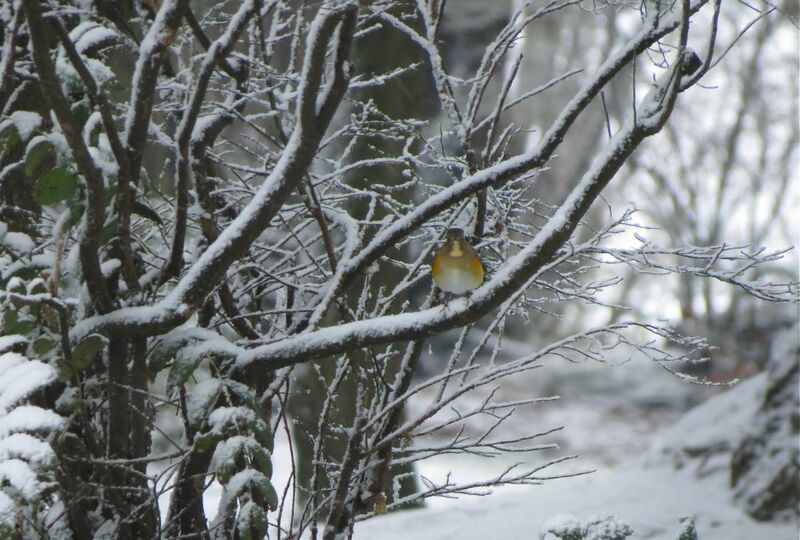 In fact, the Red-flanked Bluetail has never been seen before in Canada until yesterday. A single bird like this usually results in a flock of birders coming to see it. And they were arriving from around the Lower Mainland and Fraser Valley in flocks this morning. But there’s a big backstory here. Last night I received an email from a birding friend who had seen a bird on Sunday morning that he just could not identify. Could I help suggest what he may have seen? If Colin couldn’t identify what he’d seen, I knew it had to be something really special. As soon as I read his notes and looked at his field sketch, I thought I knew what he’d seen. And the last ones of this species I had seen were in Japan! A quick flick through one of my Asian bird books confirmed my thinking: looks like a Red-flanked Bluetail. MEGA sighting. I sent the information off to another birding buddy who confirmed my hunch. 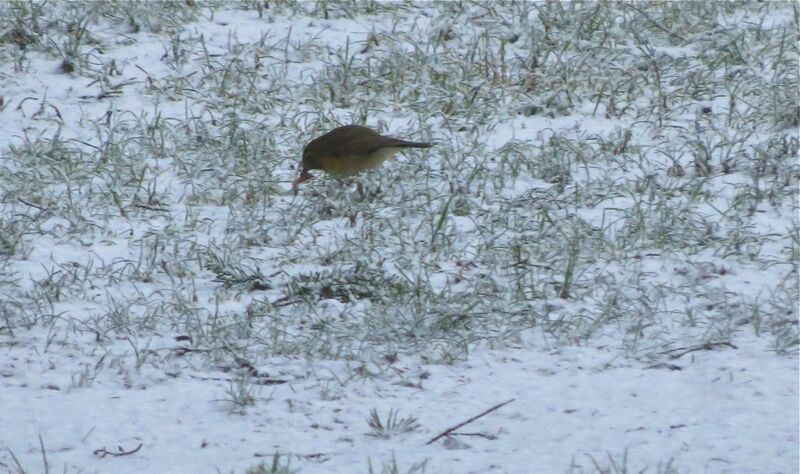 But, now we had to confirm the bird’s identity by finding it again this morning, and getting some photos if possible. And you know what the weather was like this morning – black ice and snow. I couldn’t believe it, on this of all mornings. The Birding Gods were seemingly against us. I arrived at the children’s playground, just north of the petting zoo at daybreak – except day wasn’t really breaking, although my heart nearly was. Just the dimmest of dawns was struggling to emerge under dark skies and through steady snow. However, a movement caught out of the corner of my eye had me searching through the gloom. Nope – Song Sparrow. Then another movement, and HERE WE GO – an unmistakeable profile, but no plumage or other details visible, and just a struggle to track the bird as it flitted from tree base to tree base. I couldn’t get a photo – too dark, the bird was too active, and where are the rest of people who should be here by now? A few better looks with some colour and detail were followed by guess what? Not only had my birding buddies not appeared, the bluetail had disappeared, and I still hadn’t had a really a good look to absolutely confirm the identity. It’s times like this that a birder’s stress levels really rise. After half an hour of careful but frantic searching, my birding buddies appeared, but still no bird. 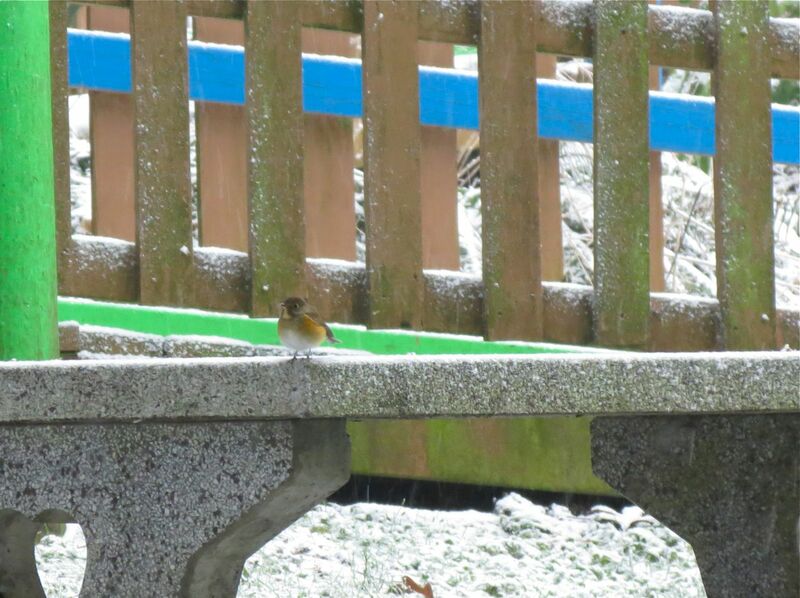 And then, as though materializing from the snow itself, there was the bluetail. The light was better, the bird was close, and we could confirm the identity after finally getting a good look at the diagnostic white throat. Better still, Sharon’s a photographer too, and we got our confirming pictures for the record. A couple of hours later the local birders were truly flocking in. We’d put the word out. An amazing number of people, it seems, had trouble getting to work this morning because of the roads, but the New West roads were magically much easier to drive, and people’s illnesses seemed very short-lived. Hmmm! Let’s hope our tiny visitor from Asia hangs around a while longer. The word is flooding out across the birding universe, and visitors will no doubt be arriving from across the continent in the days ahead to see this ultra-rarity. In the conditions this morning, my photos were poor. But here’s a couple more to round out the story. The bird looks extremely healthy, and is finding lots to eat. It consumed a large worm or grub while we watched, and it seems to be able to find insects, even in these conditions. To find the bird, park or walk into the parking area at 1st Street and 4th Avenue. Head to the left into the forested North West section of the park. 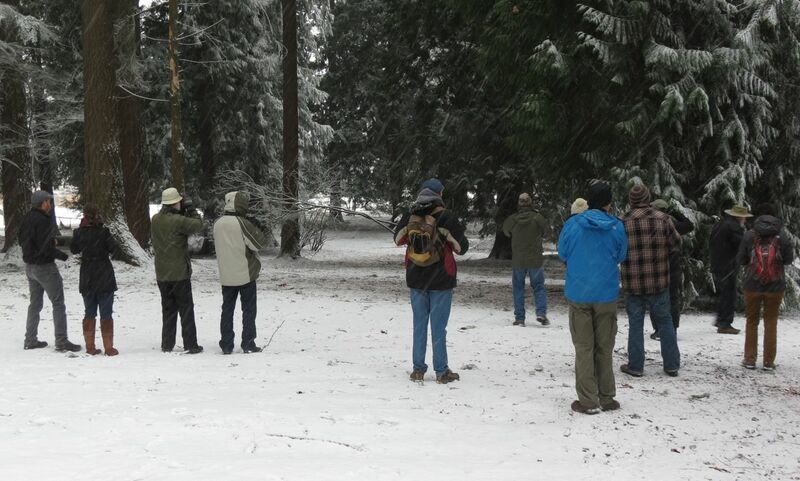 Look for the other birders, or look around the forest behind (west) of the children’s playground. The bird flies low to the ground , rarely going as high as 2 meters. Good luck. January 1st is the traditional day for birders to get outdoors and make a good, birdy start to the New Year. Have to get that “Year List” started! There’s a buzz of anticipation. And with many unusual and rare birds identified during the region’s Christmas Bird Counts, there are lots around to find. 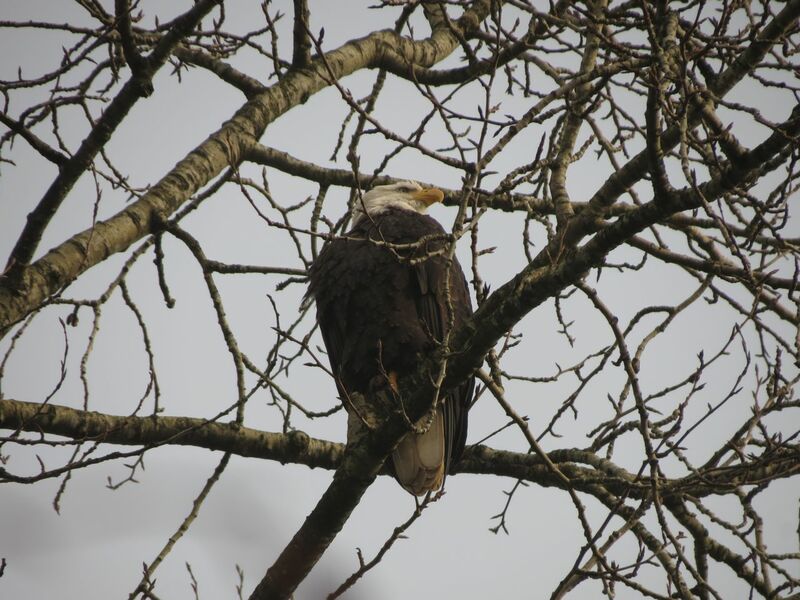 Whether starting a list of the birds in your local patch, or in Greater Vancouver, or even in the whole Province, New Year’s Day promises to get the lists off to a strong start. Can’t miss those winter rarities; you just don’t know how long they’ll stick around. Plus the benefits of a day in the fresh air after the season’s celebrations are a pretty good incentive too. If you’ve seen the movie The Big Year, you’ll know the extremes that some birders go to in pursuit of the ultimate Year List. But for me this year, I intended to take a more relaxed approach, and set some much more modest targets for my first day’s birding of 2013. Not for me getting caught up in the race to see everything, just to tick it off on the list. A nice leisurely breakfast, a resolve to take some pictures for the blog, and with the foggy morning, no great rush to get outdoors. I could start with the birds in the yard, and make my way by bike to Burnaby’s two main lakes to start a more constrained Year List. 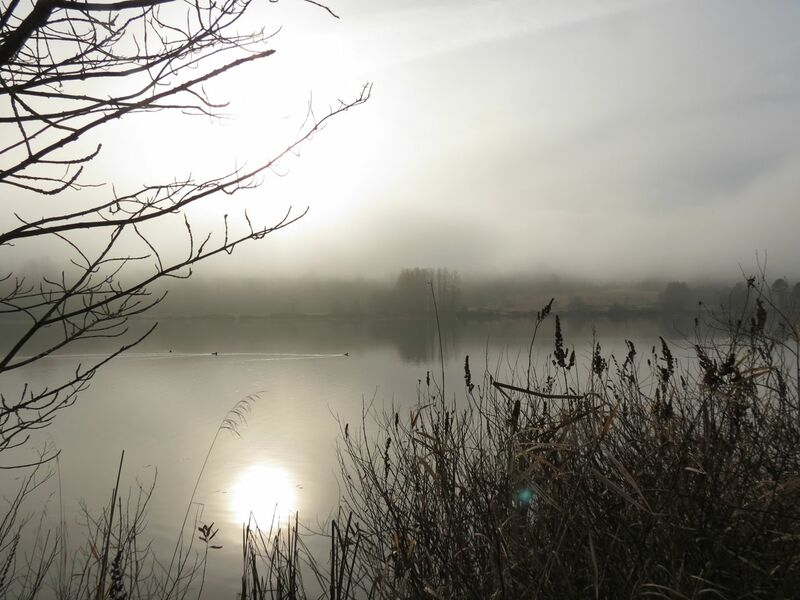 Winter is the best time of year for a variety of ducks on our local lakes. The Bald Eagles know this too. Here’s an adult bird scanning the lake for easy prey; watching intently for any sign of weakness that may make for an easy capture, and a New Year’s Day meal. 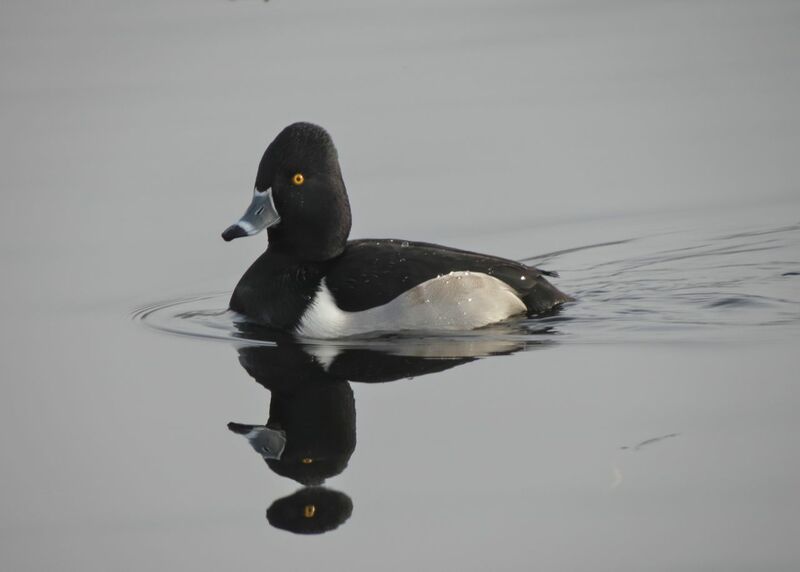 Ring-necked Ducks are one of the species found on Deer Lake. Here, the dead-calm conditions of the foggy morning, and the clear reflections on the lake, allowed for a bit of photographic whimsy. On the way to Burnaby Lake, along the east side of the rugby fields, Still Creek offered a couple of beauties. 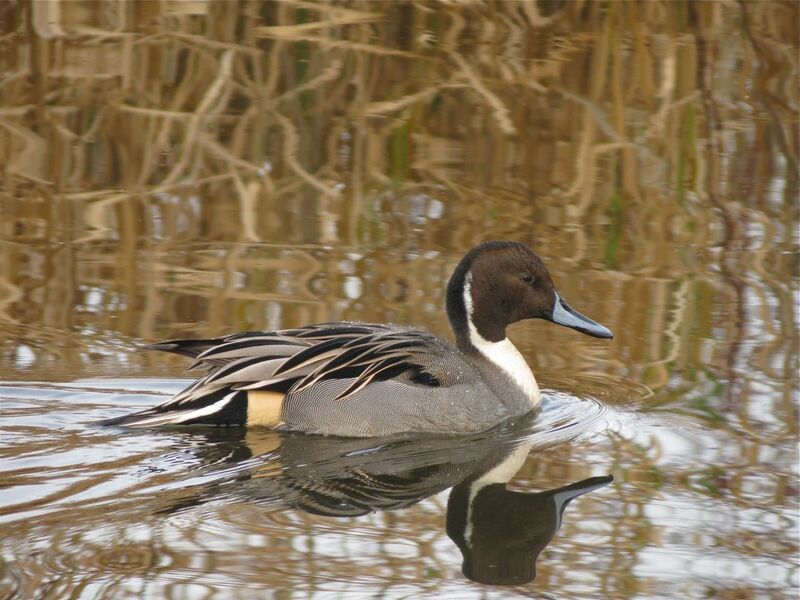 First, this spectacular Northern Pintail. More often out of camera range in the middle of the lake, this one allowed very close views. Could we also call this slender, blue-billed beauty with the elaborate plumage the Irony Duck? I often think so. For many duck hunters this bird is a favourite target. It’s beauty makes for its appeal. How ironic then, that what’s beautiful makes it desirable to kill? And there’s a double irony at work here too. It’s those very same hunters who, in order to preserve their beautiful prey, contribute millions of dollars to the preservation of the wetlands vital to the breeding and wintering of this species. Irony indeed. 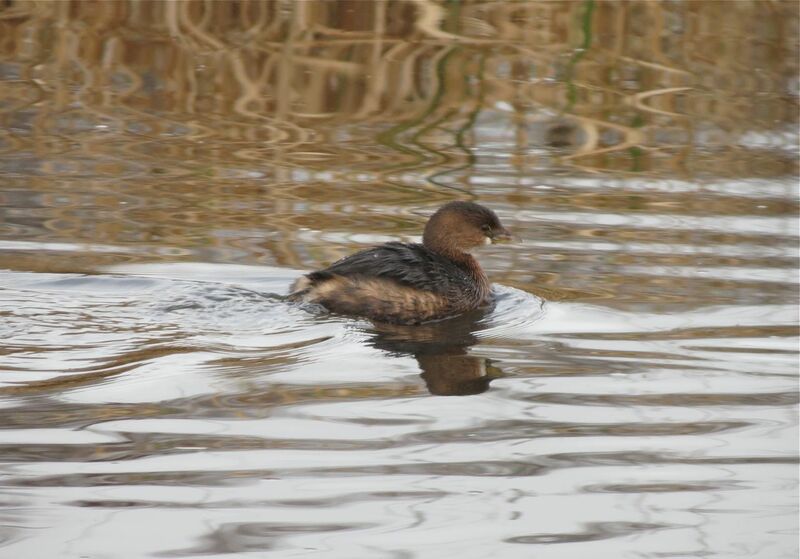 Not a duck at all, but another diving waterbird, the diminutive Pied-billed Grebe is another favourite of mine. In winter plumage here, but you can see a hint of what’s to come, and the source of the bird’s name, with the faint dots on the bill that will become black, and form a complete ring around the bill come spring time. Burnaby Lake is probably our best location for closeup views of ducks. The Piper Spit boardwalk is a great place to hone your identification skills. Here’s a few I photographed on New Year’s Day. 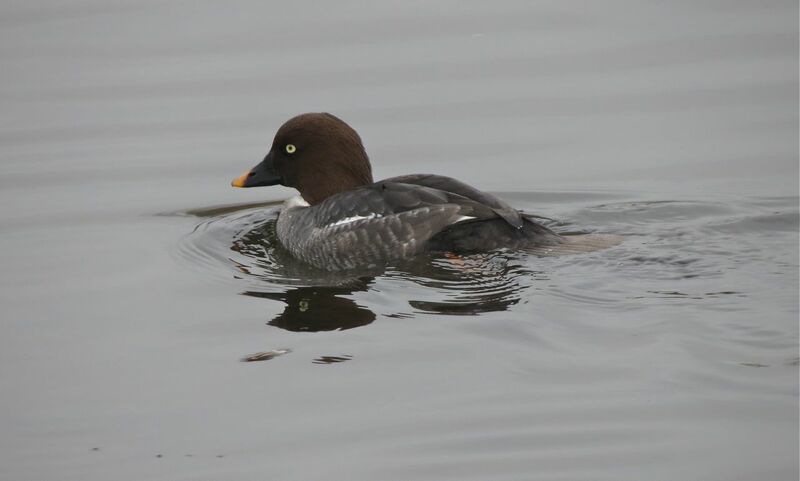 Above is a Common Goldeneye female, which is a diving-duck relative of the much smaller Bufflehead shown below. 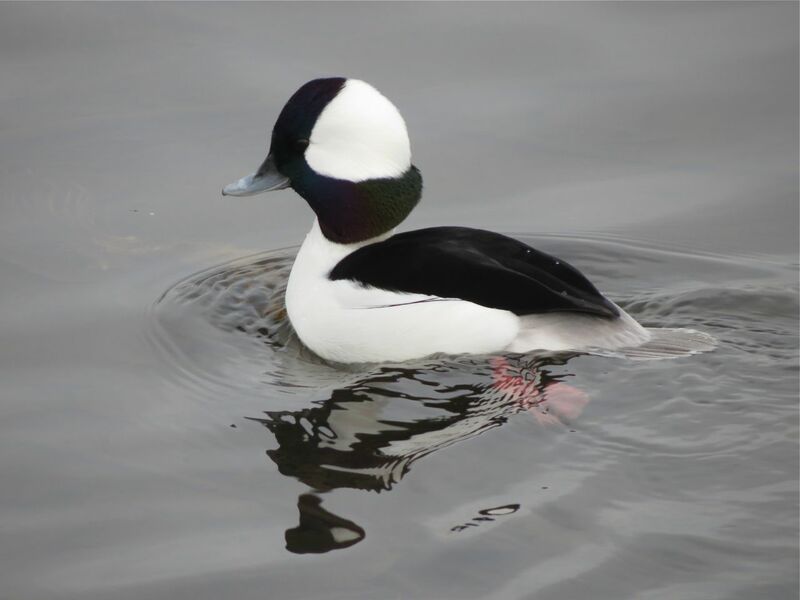 Being a diving duck, the Bufflehead can forage in deeper waters than the dabbling ducks shown below. 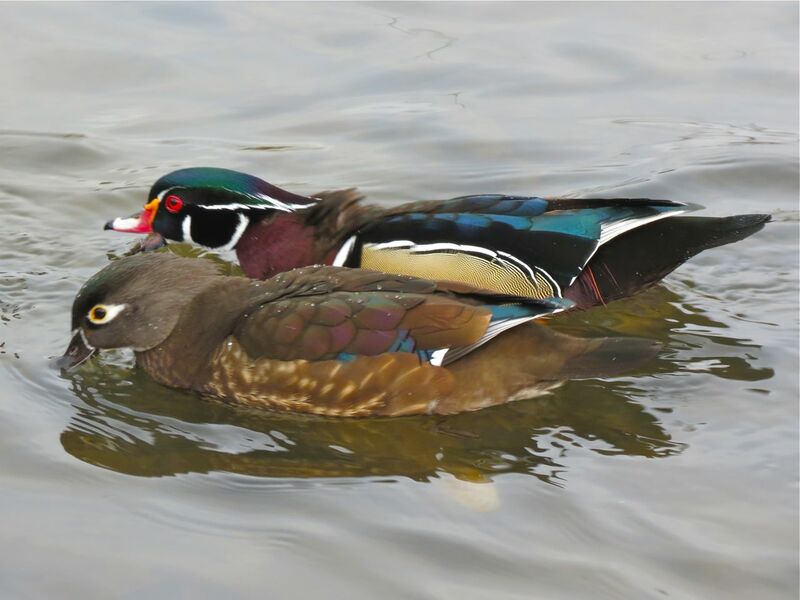 The elaborately plumaged Wood Ducks are dabblers. 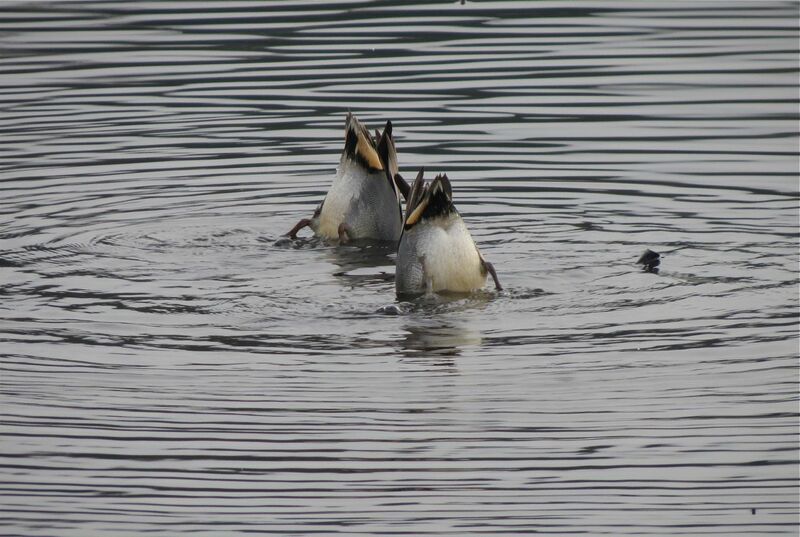 Unlike diving ducks, dabblers rarely dive, but prefer to feed by upending in shallower water, as handily demonstrated below by a couple of Green-winged Teal. On this year’s December 16th Christmas Bird Count (see previous post), our “best” bird was undoubtedly the White-winged Crossbills found at Burnaby Lake. And even better for starting all those New Year lists, they’re still around, and many local birders were out trying to add them to their lists. This is not a bird seen every year in the Vancouver area. Red Crossbills are relatively common here, but the White-winged is a special visitor. As I headed east from Piper Spit along the main Burnaby Lake trail to Conifer and Spruce Loop trails where the birds were being intermittently seen, I anticipated getting the usual view of crossbills – at treetop and distant. Walking toward the huge Sitka spruce tree (almost certainly the largest in the Park) just before the start of Spruce Loop, I spotted a photographer pointing her camera into the tree. 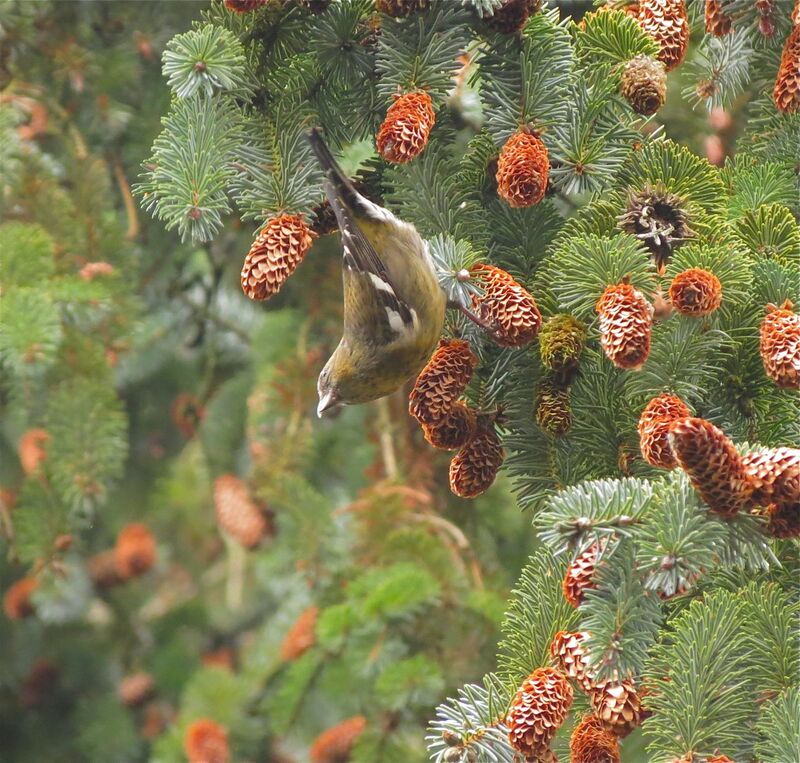 And there, stunningly, some no more than 8 meters above the trail, was a flock of about 30 White-winged Crossbills hanging from the cones actively feeding. Avian nomads of the northern half of the Continent, crossbills wander the immense coniferous forests in large flocks looking for the cone crops they depend on for food. Using their crossed bills to wedge open the cone scales, they extract the highly nutritious seeds with their tongues. Individual birds can consume up to 3,000 conifer seeds in a day. Click on the images above and below to get a closer look at the highly specialized bills of these birds. 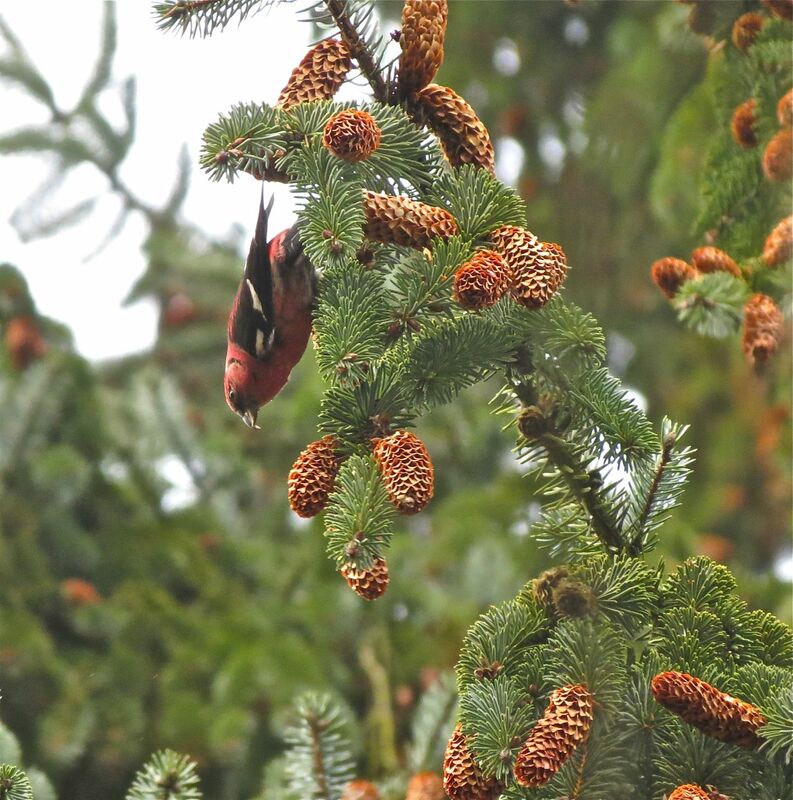 Crossbills are also notable for breeding whenever there is a quantity of food sufficient to support the development of eggs and the raising of young. The consequence being that they can breed at any time of year, and frequently do, even in the depths of winter! These birds, however, are unlikely to be breeding. What we’re seeing here is part of a broader search for food this winter among many different species of finches, and a likely indication that more northerly cone crops are low. What a great kick-off to the New Year’s list. And if I can see White-winged Crossbills on January 1st, who knows what I might see if I chased a little harder. Hmmm! Click here for White-winged Crossbills, and here for Red Crossbills.